Prime location for hotel development, retail, restaurant, office building or medical. Excellent frontage on Hwy 96/69 and Anchor Dr. that includes hard corner at Lake Arthur Dr. Large 40 ft wide driveway off of Hwy 96/69 feeder already built. OWNER FINANCING is available if buyer purchases entire 16.4 acres. Buyer responsible for roll back. 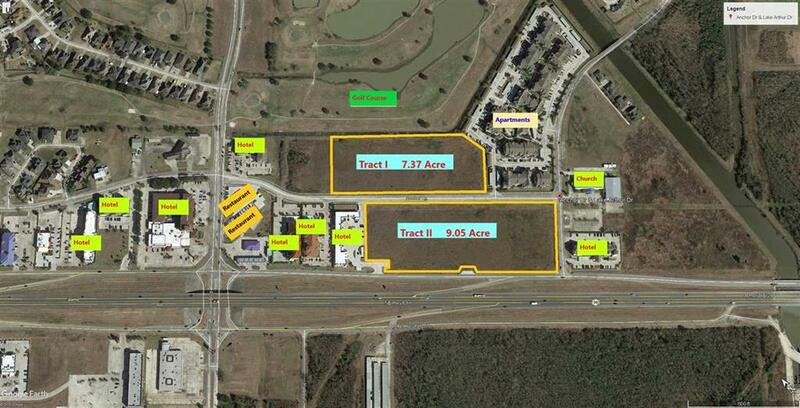 Sale price based on $3.75 psf for entire 16.4 acres. Contact listing agent for additional information. From Central Mall go south on US Hwy 96/69 (also known as Memorial Hwy) turn east on Jimmy Johnson, turn south on Anchor Dr. property is located south of Days Inn Hotel. $11,691 would be your approximate monthly principal and interest payment. This payment is based on a 30-year loan at a fixed rate of 4.12 % with a down payment of $268,200. Actual lender interest rates and loan programs may vary.